A Cake Bakes in Brooklyn: Sausage Cake: Don't Lick the Bowl! 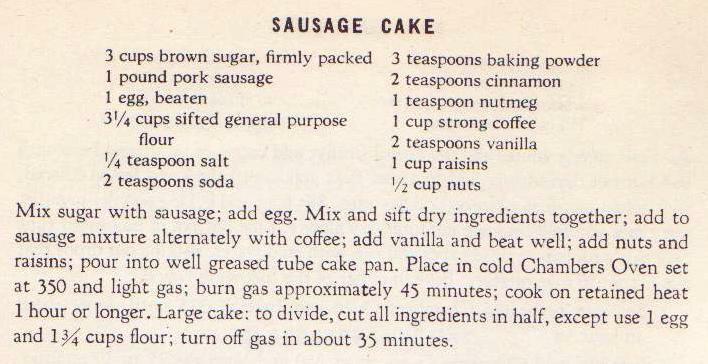 Yes folks, I discovered not one, but two Sausage Cake recipes in my collection. As in raw pork sausage. As in no fighting over who licks the bowl. I wanted to bake something from the c. 1940 Chambers stove cookbook I purchased recently at a flea market and that I had been looking for for nearly 15 years, ever since I got my Chambers stove. But disappointingly, the recipes all seemed so pedestrian -- until, that is, I turned the page and found this treasure. I never thought I'd see "sausage" and "cake" next to one another, but here it was. And I was intrigued. The cake was easy, if weird, to make. I'm used to softening butter and measuring sugar, not removing casings from sausage. I probably overbaked it, because I just couldn't imagine that all that sausage could cook through in just 40 minutes. The next day, when I put the cake on the conference table at work, I had the foresight to scribble on a Post-It: Not Vegetarian. No one at work could guess cake's secret ingredient, although one rather non-adventurous eater literally spit it out when told of the sausage. Sausage cake takes the one-pot meal concept to a whole new level: main course and dessert all in one! It's really quite efficient as I discovered the next morning when I had a big slice for breakfast figuring that it was like eating eggs, sausage and a muffin, all in one. I followed the recipe in the Chambers cookbook, but cooked it with the gas turned on -- Chambers' big claim to fame was "cooking with the gas turned off," saving energy and freeing the cook from the responsibility of tending to a hot oven. I'm pretty fearless, but I've never mustered the courage to turn the gas off, trusting that what's in the oven will finish cooking with the ambient heat. 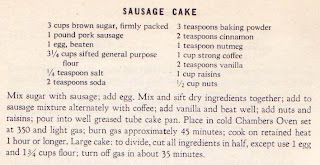 The other sausage cake recipe in my collection is from the Indiana Rural Letter Carriers' Auxiliary Cookbook, c. 1977, and included a broiled icing (below) made of brown sugar, coconut, butter, nuts and cream. I added that to my cake, figuring if the cake didn't work out, we would certainly enjoy the topping. Upon researching this sausage cake I have read that it is like a dense cake like fruitcake. Did you find that to be the case ? Yes, I recall it being quite dense but not having *enjoyed* a fruitcake for many, many years, I can't really compare it. Since I wrote this post, I have found many similar recipes in my collection including one written in a notebook and then crossed out with the words: NO LIKE scribbled at the top! I have made a cooked sausage cake before but not raw. Can you share the icing recipe? I LOVE coconut, caramel pecan icing. Some people think it is odd to make a sausage cake but will have pigs in a blanket or even mince meat pie. It's been awhile, but since I didn't publish the icing recipe, I probably just combined coconut, pecans, some melted butter and a bit of cream and spread it on top. Sorry I can't be more specific, but you can check my go-to coconut pecan icing, which is on the German's Chocolate package. If I find it at home, I'll post here. I can't stand fruit cake, but this sausage cake recipe is so similar to the one my mom made and I loved her cake,, it is dense,, but its soooo yummy.